There’s no prosciutto. There’s no fresh pasta. And we’re all out of cookies. I’m not sure this really is the utopia they’re making it out to be. The stark contrast between life in Alexandria and the life of those experiencing the zombie apocalypse reached a head at a cocktail party tonight, and it was too much for Sasha to handle. When you’ve lived through cannibals eating your boyfriend’s leg and walkers killing your brother, getting pestered about your favorite dish is a triviality too far. Rick’s gang is doing their best to fit among the more civilized residents behind the wall to varying degrees of success. Maggie and Glen are fine. Abraham is trying hard with a little help from his friend alcohol. Michonne is trying, too—trading in the katana for a plastic cocktail sword and wearing a dress. She really wants this to work. But “ordinary life like before,” as Jessie puts it, is a tough thing to adjust to. Jessie helps Rick adjust, though remnants of civilization like the sanctity of marriage are kind of getting in the way. Or you can have cookies, kid? What’s it going to be? So after all these encounters where Rick’s gang encountered psychopaths, they’re the closest thing Alexandria has to villains right now. Kissing another man’s wife. Rudely shouting when someone is just trying to cook you a nice dinner. Stealing guns from the armory. And, oh yeah, making a kid need years of therapy when all the psychologists are probably dead. So is Sasha right? What they have in Alexandria, is it not real? Are Rick and the gang heroes for reminding them what life is really like in the apocalypse or is what Deanna is trying to do worthwhile? Is Rick right saying that they’re lucky to have them there? Lots of questions for you this week, Shane. That would have been a spectacular email just for your yeoman’s work of transcribing Carol’s legitimately insane speech to that kid, but you also coined the phrase “a triviality too far,” which should be the title of a British manners drama, if it’s not already. Well. DONE. I think what really hit me tonight was how deeply strange all of these people are within the confines of civilization. Rick might be the most normal one, and he can barely be bothered to stop staring like a man who has just been stunned by a loud explosion and respond when people try to make conversation. And at the end, he presses himself against the wall and thinks…what? How great their lot has been? I loved seeing Daryl make progress tonight. I thought it was a really great moment when Carol distributed the guns at the end, and we got to see who still thought they were necessary. Carol did, but we learned that Carol is still nuts. Rick did, just barely. And Daryl did not—he just needed somebody to believe in him, and to give him a purpose. Aaron did just that, and now he’s back in the fold. No more moody Daryl, Josh! Badass, fun Daryl again! I don’t think Sasha is right—Deanna was right to call BS. Sasha is clearly suffering from PTSD, though, and I would like to make a humble suggestion to the residents of Alexandria: Do not let her in the tower. At all. Seriously. She’s got Charles Whitman written all over her, judging by the weird catharsis she experienced by shooting those innocent family photos. As for Carol…I mean, how do we even talk about it? It came from nowhere, Josh, completely out of left field. That kid will never be right again. I don’t know if I’ll ever be right again. The content was disturbing, as your transcription aptly demonstrates, but the glee she took from the speech was what really gave me the willies. That scene was so strange and memorable that it’s almost like I’ve been watching a fake Carol all these years, and we just saw her bona fide psychopath interior seep to the surface. Somehow, even killing those sick people at the prison didn’t seem quite so bad—at least there was a twisted logic there. But as for your big question, I made a mental note of that same line: “They’re lucky we’re here.” Hmmm…. Time will tell, I guess, but I think you and I are leaning in the same direction. This gang of weirdos is going to destroy Alexandria from the inside, somehow. A few questions for you: Where’s Eugene? Are there now officially too many cast members to even bother touching base with them all every week? Is Rick going to kill that doctor for the sheer pleasure of it? 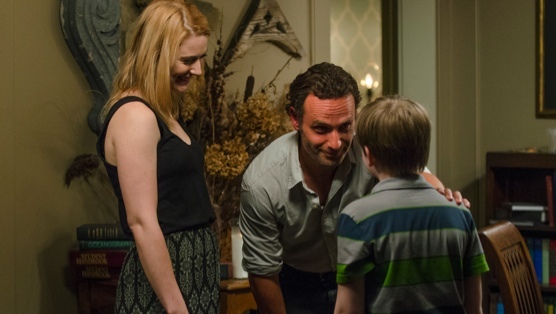 Was Jessie holding Judith on purpose to demonstrate her potential motherly nature to Rick? Will Daryl ever find that pasta maker? Will that kid ever enjoy cookies again? I have to admit that I didn’t even notice the absence of Eugene or Tara this week, but now that you mention, I kind of want to see Eugene at that cocktail party. This has got to be a dream come true for a guy like Eugene, but what job does Deanna give him? And why isn’t the Eugene Fan Club inundating the producers, demanding MORE EUGENE!? As for Rick, there was a moment there at the very end, when he was leering at Jessie like a shameless construction worker while she was walking home with her husband, that he reached for the hidden pistol. All I could think of was the story of David and Bathsheba. Is Rick going to find some way to send Dr. Pete to the front lines to get him out of the way? Or is he going to take a more direct approach? Or is he going to just completely ignoring his existence and keep awkwardly trying to kiss her at cocktail parties? I don’t think he’s about to let this one go. I’m mostly with you on Sasha. The trauma of being out in the wild, particularly everything that’s happened since Terminus, has gotten to her, and she can’t appreciate the simple joys Alexandria offers. But its residents are also a little blind to the dangers she’s encountered, and that’s got to be a little maddening. In that sense, the injection of Rick’s gang into the mix might not be the worst thing for the mild-mannered citizens here. And that kid better enjoy his cookies. He’s worked hard enough to get them. Final question: Describe for me what Eugene’s video interview was like. And then I think he panicked, ran beyond the walls, and was gobbled up by zombies within 30 seconds. As for Dr. Pete, I am fascinated by this whole thing. For the first time, starting late in last week’s episode, we’re beginning to see a sort of aggressive, wolf mentality from Rick. He’s willing to take Alexandria, and now it seems like he might be going after a married woman. It’s a big shift for a guy who seemed obsessed by propriety even in the darkest circumstances. I like it! I have no loyalty to Dr. Pete, Josh. They don’t even have to make him evil for me to be fine with Rick “taking care of business.” I feel like they’ve earned my support on that one. Okay, time now to eat some cookies and shudder at the memory of Carol’s speech. Until next week, please don’t die, Daryl Dixon.